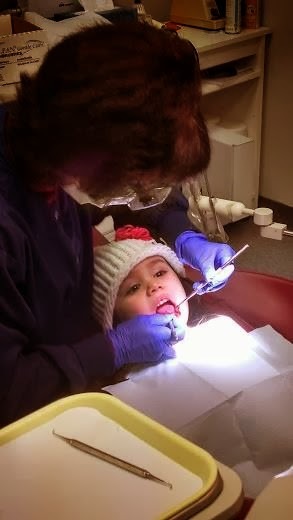 "February is National Children’s Dental Health Month – and February 14th is Valentine’s Day. BUDDY and his friends from the PBS KIDS series Dinosaur Trainwould like to help you celebrate both!! This month, The Jim Henson Company has teamed up with Sunstar Americas, Random House Children’s Books and PBS Distribution to offer a review and giveaway for your readers of the Dinosaur Train GUM® twin pack toothbrush set, the Little Golden Book Buddy’s Teeth, and the new DVD Dinosaur Train: I Love Dinosaurs. To help you and your children “Join the Super Smile Team,” The Jim Henson Company has partnered with Sunstar Americas. 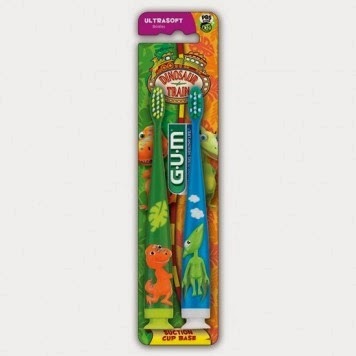 Inc. to offer a review and giveaway set of the Dinosaur Train themed toothbrushes! With an emphasis on making brushing fun for young children, Buddy and Tiny are featured on a GUM® twin pack toothbrush set with ultrasoft bristles that are gentle on young gums, a narrow, tapered head that is comfortable in small mouths, and a soft grip to provide more control. Available on amazon.com, ToysRUs.com and at gumbrand.com. SRP: $2.99. "A fun and motivating toothbrush for children 2-5 years old! Brush for at least two minutes twice a day, morning and night to begin the right course for a lifelong healthy mouth. " Plus, children ages 2-5 will love to read Buddy’s Teeth, a Little Golden Book from Random House Children’s Books that retells an episode of the series in which Buddy experiences something all kids go through—losing a tooth! Available wherever books are sold. SRP: $3.99. BUDDY wants to share his own dental care tips too! Remember that Tyrannosaurus Rex replaced their teeth throughout their lives, but humans only get two sets so it is especially important to take good care of them! 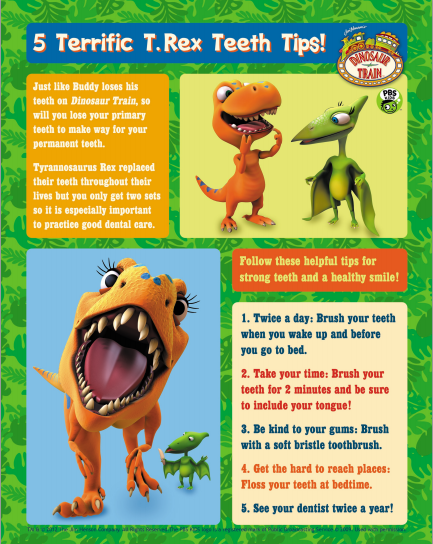 Click here to download your very own Dinosaur Train Teeth Tips Poster. And for more Valentine’s Day fun, sit down with your family and friends and enjoy watching the all-new Dinosaur Train: I Love Dinosaurs DVD from PBS Distribution. Buy now on DVD from Amazon for only $7.99. 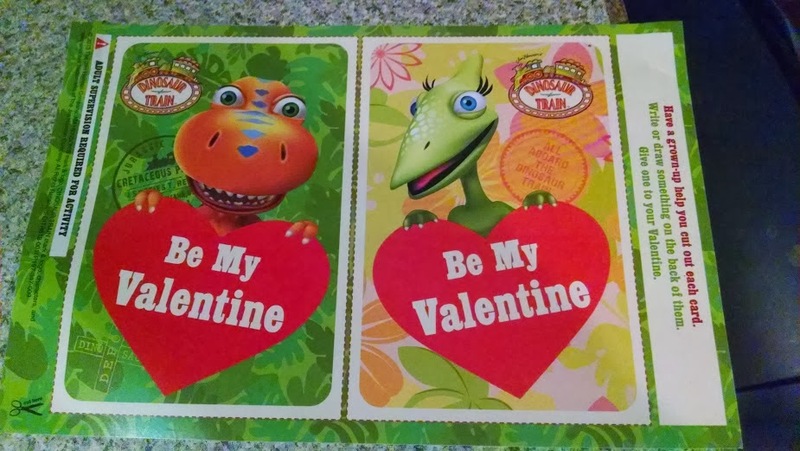 Featuring four outstanding adventures and two Be My Valentine Cards, Dinosaur Train: I Love Dinosaurs makes for an outstanding Valentine’s Day treat! Two of the stories included on this DVD are King Meets Crystal and Erma and the Conductor. In King Meets Crystal, King Cryolophosaurus is interested in becoming friends with Crystal, but he gets nervous when trying to talk to her. Tiny and Buddy help King overcome his nervousness. 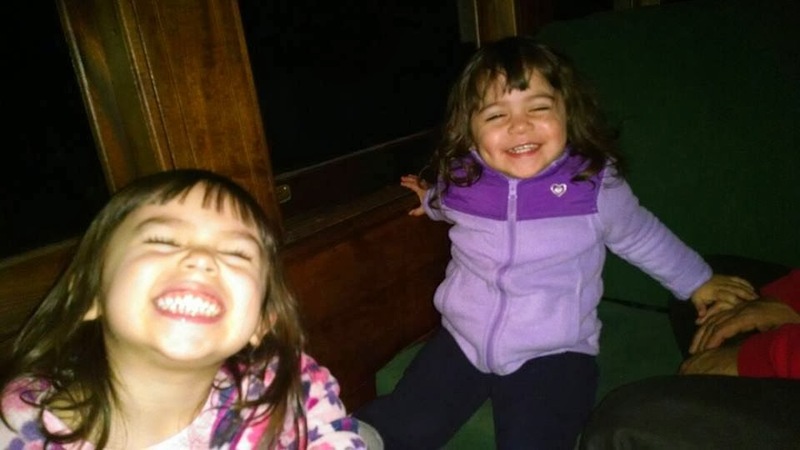 In Erma and the Conductor, the Pteranodon family is on the Dinosaur Train headed to the Big Pond to watch a meteor shower! Mr. Conductor stops to pick up Erma Eoraptor, his best friend. At the Big Pond, the Conductor and Erma are interrupted a few times while trying to be alone, but soon find the perfect spot back on the Train. Running time approx. 50 minutes; SRP: $7.99." FINALLY, watch out for all new Dinosaur Train episodes coming later this year! 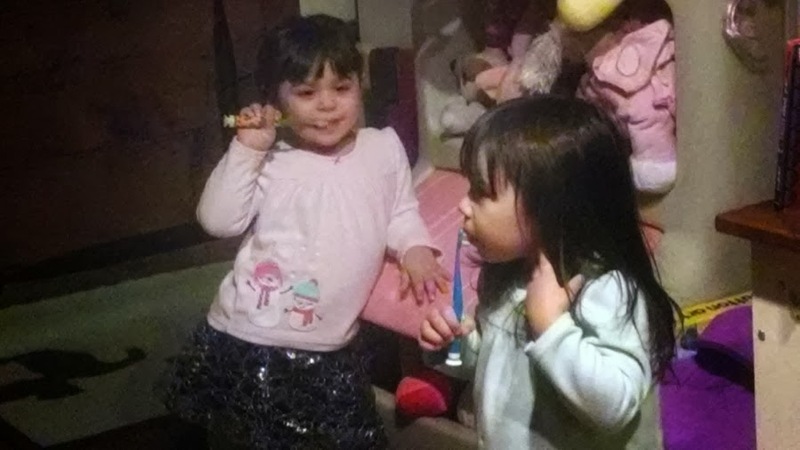 Savannah called "Tiny," which she dressed up as for Halloween, while Bella wanted "Buddy." I was thankful that they each wanted a different character card, as it prevented fighting. 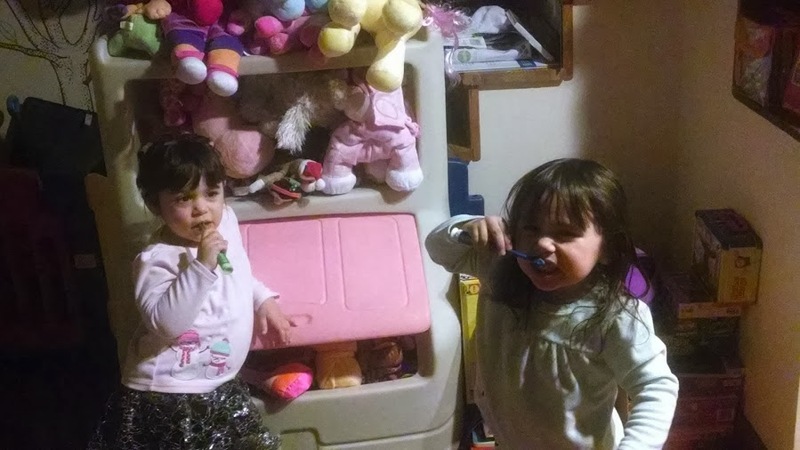 :-) I asked who they wanted to send their Valentine's to, and in unison they said "Nana and Papa." So, as I prepped the DVD player, they took out their crayons and began scribbling a message to my parents. Then, as they watched all four episodes that make up this love-themed DVD, I mailed off their Valentine's Day cards (which are now on display on my parents refrigerator). Out of the four episodes, Savannah's favorite was "King Meets Crystal," which was about King Crylophosaurus meeting a fellow singer and Crylophosaurus named Crystal, at the Troodon Music Festival. Fans of the show will remember how King is always shy when it comes to singing and usually needs to be talked into singing. Well, in this episode, with the help of Tiny and Buddy and the talk with Crystal, the King is able to overcome is nervousness and fear, and sing. I love watching Savananah pretend to sing like the King, or have her tell me how funny he sound (the King is voiced by Phil Hayes). I keep trying to tell her that he is supposed to be like Elvis Presley, the King -- but, she just fluffs it off and doesn't pay attention. :-) Kids! As for Bella, she is content watching all four episodes and doesn't seem to have a favorite. As long as it has Buddy in it, she is happy. She is easy to please. :-) Overall, I have to say the four episodes that make up this recent DVD release are truly entertaining and make for a great segway into Valentine's Day with the kids. While my girls still watching Christmas movies, they are starting to ask for Valentine's Day and Easter movies -- so this new release fits the bill. If you have a Dinosaur Train fan in your family, this would make for a great gift idea or surprise. I am guessing that tomorrow during our weekly Friday Night Flicks night with the girls, that they will be asking to watch this DVD again. :-) I wouldn't object as it really is fun to watch, and the theme song is addicting. While my girls haven't started losing their baby teeth yet, I will definitely be keeping this book close to share with them, as I know they will have questions like Buddy did on why they lose their teeth. It is nice to see books like available so that parents can pick and share with young children, and help ease some of their fears and anxieties when it comes to losing a tooth. In addition to Buddy losing his tooth, this book also talked about bad breath and the need to brush your teeth and take care of your teeth in order to keep the bad breath away and your teeth healthy. I reiterated this with the girls and said this is why we brush a few times a day, so that their teeth stay healthy and strong, and that they don't have "PU Breath" :-) Savannah then chimed in and started talking to Bella about her recent first trip to the dentist and how they cleaned her teeth and showed her the proper way of flossing. Want to win the the above DVD, "Buddy's Teeth" storybook and pack of Dinosaur Train toothbrushes? Then, complete the entries on the Rafflecopter form below for your chance to win this great prize pack. Good luck!